WINSLOW — While some girls dream of turning frogs into princes, it was a frog that turned Alexis Baxter into a scientist. During her sixth-grade year at Winslow Junior High School, Baxter’s life changed when she dissected a dead amphibian. A decade later, Baxter is a Fulbright scholar. In March, Baxter, 21, learned that her fellowship application to the Fulbright Program was accepted. As a result, she will travel to Oslo, Norway, for almost a year of intensive research. Every year, about 7,500 people around the world receive grants from the highly competitive Fulbright Program. Established in 1946 by U.S. Sen. J. William Fulbright of Arkansas, it is designed to “increase mutual understanding between the people of the United States and the people of other countries,” according to its website. Grant recipients are chosen for their academic achievements and leadership skills, and are provided opportunities to study, teach and conduct research abroad. 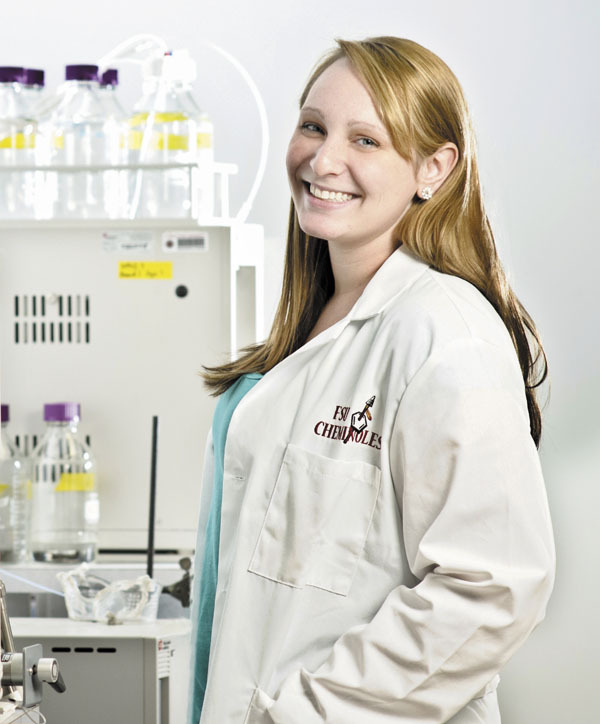 In May, Baxter graduated from Florida State University, where she majored in both biochemistry and environmental chemistry, and researched algae for potential use as a biofuel source, among other things. Baxter’s work with algae is akin to the work she’ll do in Scandinavia. The Norwegian government recently adopted stricter quality standards for water bodies, including a provision that algae blooms cannot occur in lakes by 2015. For 10 months beginning in August, Baxter will perform fieldwork and lab work with a Norwegian professor to help the country comply with the standards. Baxter said algae blooms occur when agricultural runoff and acid rain combine. The blooms deprive water of oxygen, which reduces the diversity and abundance of aquatic life. For the rest of July, Baxter — a 2008 Winslow High School graduate — will be an intern for the Maine Department of Environmental Protection, thanks to funding by the Maine State Government Internship Program, administered by the Margaret Chase Smith Policy Center. Baxter’s duties include mapping watershed boundaries and drainage systems throughout the state. Baxter said growing up in Maine helped foster a love of nature, and that’s why her studies often focused on the environment. And, although a hapless frog helped turn Baxter toward science, it was Winslow High School teacher Jim Good that sealed the deal, she said. Good, 60, said Baxter’s acceptance by the Fulbright Program gives her the potential to join ranks with the greatest minds in science. “If you look at time, going back to Michael Faraday, Newton and all those guys, there’s a chain of top-notch scientists over the ages. They are all connected to each other — by being students of each other — and their knowledge is passed on,” Good said. Baxter’s mother, Kim Leadbetter, said her daughter worked hard to become a Fulbright scholar. She said the accomplishment is just one example of a tenacious spirit. Leadbetter said Baxter paid for college on her own, through a combination of scholarships, loans and as many as three jobs at a time. Baxter said her drive to succeed comes from a simple place. When Baxter returns home from Norway, she will attend Penn State University, to pursue a doctorate in chemistry. Afterward, she hopes to attend a post-doctorate program at the Massachusetts Institute of Technology, or a similar one in Zurich, Switzerland. But Baxter hopes teaching will play some part of her future.